The City of Boulder obtains about 80% of its water supply from the Boulder Creek watershed, and return flows from the city are extensively used for agriculture downstream. The Orodell gage is the primary gage used for monitoring Boulder Creek. Three tree-ring reconstructions have been developed for this gage since 1999, each incorporating more recent tree-ring chronologies to provide a longer calibration period. The latest reconstruction was developed in 2005, by Jeff Lukas and Connie Woodhouse, for AMEC Earth & Environmental (formerly Hydrosphere), consultants for the City of Boulder. The calibration period includes the extreme drought year of 2002. This reconstruction was then used in a study to model the city's water supply under both future climate scenarios and the past variability seen in the tree-ring record. Woodhouse, C., and J. Lukas. 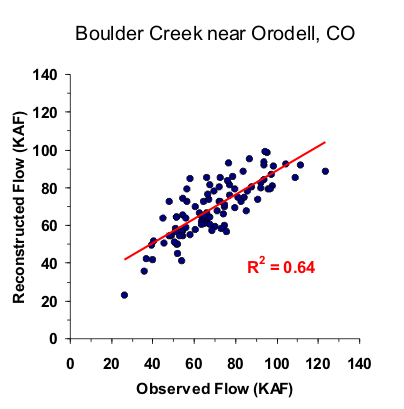 Streamflow Reconstructions for Boulder Creek, South Boulder Creek, and the Colorado River. Report to City of Boulder and Hydrosphere Resource Consultants, January 2006. A forward stepwise regression procedure was used to calibrate the observed flows with a pool of potential predictors consisting of ~25 tree-ring chronologies from Colorado (both east-slope and west-slope). The residual chronologies, with the low-order autocorrelation removed, were used. Four predictor chronologies were selected by the stepwise procedure for the reconstruction model. Validation statistics were computed using a leave-one-out (cross-validation) approach. Figure 1. Scatterplot of observed and reconstructed Boulder Creek annual flow, 1907-2002. Figure 2. Observed (black) and reconstructed (blue) annual Boulder Creek annual flow, 1907-2002. The observed mean is illustrated by the dashed line. Figure 3. Reconstructed annual flow for Boulder Creek (1566-2002) is shown in blue. Observed flow is shown in gray and the long-term reconstructed mean is shown by the dashed line. Figure 4. The 10-year running mean (plotted on final year) of reconstructed Boulder Creek flow, 1566-2002. Reconstructed values are shown in blue and observed values are shown in gray. The long-term reconstructed mean is shown by the dashed line.